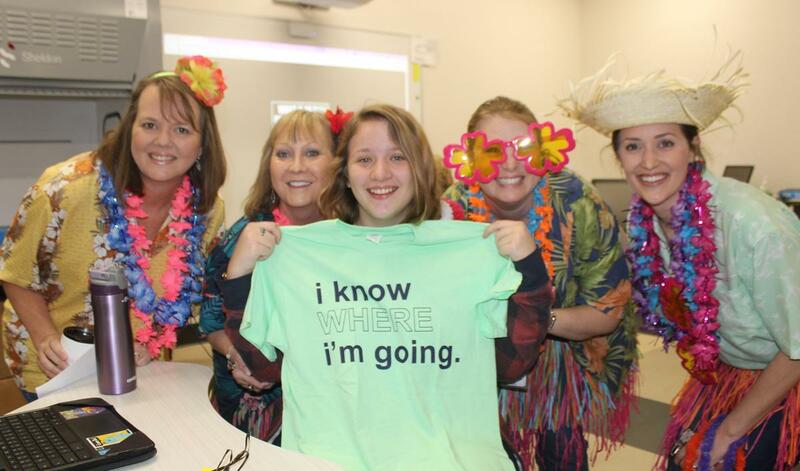 Cleburne High School counselors launched one of their favorite activities of the school year on Friday as they made surprise classroom visits to celebrate seniors who have received college and military acceptance. 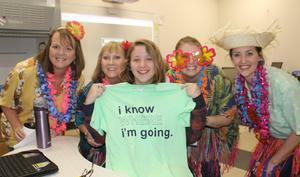 Wearing luau-themed attire, the high school’s six-member counseling team was anything but quiet as they traveled the halls each period with shouts of “ho'omaika'i 'ana” to more than 40 students. The recognition will continue as seniors report to the counseling office with their acceptance documentation. The event was also timely, as the role of the school counselor is being celebrated with the observance of National School Counseling Week, recognizing the impact school counselors can have in helping students achieve success and plan for a career. For a number of Friday’s first wave of celebrated seniors, the recognition reflects several acceptances, with scholarship, offers to match. Randall James, who accompanied the counselors as a second-period aide in the department, has heard from three state universities, choosing Texas A & M as his post-secondary destination. Lyndie Conner, who serves as the high school’s college and career coordinator and district director of the AVID program, said she enjoys the opportunity to honor students while they are surrounded by their classmates. Conner said including those who have been accepted for service in the armed forces was a unanimous “yes” when developing the recognition program. From their Mardi Gras theme in 2017 to last year’s cowboy getups reflecting the “Accepted, Y’all” t-shirts they presented, it’s all about celebrating a major accomplishment in the lives of their students as they prepare for that next step in life. Academic Assistant Principal Jeri Hall joined the luau parade during the second period, describing the initiative as one of her favorites. The CHS Counseling Department, acting on a suggestion by two faculty members, has added to their college acceptance celebrations with their “Jacket Journey Continues” postings on social media. Seniors are featured in their college shirts placing a tack on the map of Texas pinpointing the location of their next destination following graduation. Senior Stefanie Vasquez, who is still deciding on which college to attend with hopes of extending her soccer playing career and plans for a major relating to the medical field, is looking forward to the school counselors celebrating the continuance of her journey. Emily Wren was among more than 40 college/military-bound seniors treated to surprise recognition by their Cleburne High School counselors in the first wave of celebrations for students who have received acceptance letters. Pictured with Wren, who will be attending Tarleton State University, are CHS counselors, l-r, Glenna Pollock, Tina Barnes, Jennifer Cox, Christy Sims and not pictured, Lyndie Conner. 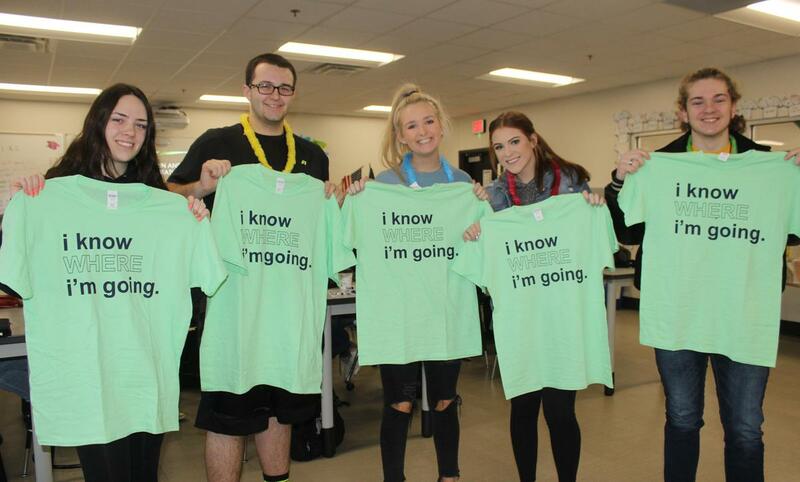 Addie Sims, Kyler Jones, Alexis White, Maddie McKinney, and Andrew Dickson are among the CHS seniors who “know where they are going,” in receiving college acceptance letters. 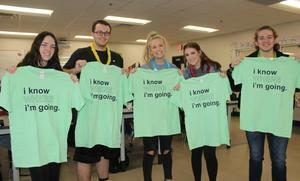 They display the shirts they were presented through the Counseling Department’s Acceptance recognition program.